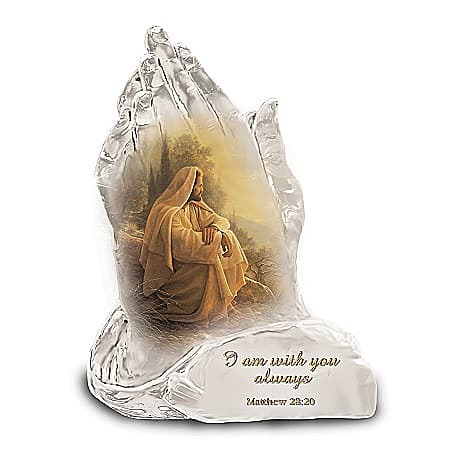 This exquisite praying hands collectible figurine captures the Savior’s promise and invites you to put yourself in God’s hands. This inspiring work of religious art is exquisitely crafted of clear, brilliant crystalline in the dramatic, fully dimensional shape of God’s praying hands. Gracing the hands is acclaimed Biblical portraitist Greg Olsen’s vivid image of Christ as He sits quietly gazing down at the city at dawn.